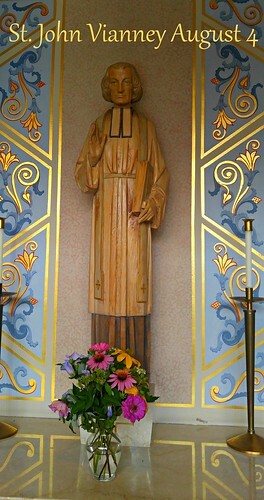 Jean-Baptiste-Marie Vianney. Three years later, the French Revolution started, and the year after that persecution of the clergy started in earnest. He had to prepare for his first holy communion in private with two nuns who had last their convent in the revolution. He also prepared for his confirmation in secret. At age 20 he was allowed to travel to Ecully to study, but the gaps in his education hurt his progress and he struggled with Latin, but worked hard. A victim of his times, St. John was drafted into Napoleon Bonepart's army but became ill two days into his conscription and eventually became a deserter. After the war, he was able to return to his studies and was eventually ordained in 1815. In 1818 he was sent to be the parish priest of Ars-en-Dombes, an isolated village some distance from Lyon. He quickly became a noted preacher and a celebrated confessor with a reputation for insight into the hearts of his penitents. He was able to convert even the most hardened sinner with a word. He would spend as many as 18 hours a day in the confessional. Tens of thousands of people came to visit this obscure parish priest and Ars turned into a place of pilgrimage. St. John worked hard and lived simply. he was swarmed by people and loved by the crowds. The devil tormented St. John throughout his ministry. He rocked his bed and made noises at night. The devil even mocked the saint by calling him a "potato eater!" One story goes that St. John was so tired one evening that when the devil started his torments, the saint looked at him and simply said, "Oh, it's you," before he went back to sleep. The French State recognized his eminence by awarding him the medal of the Légion d’Honneur in 1848, and he sold it and gave the money to the poor. 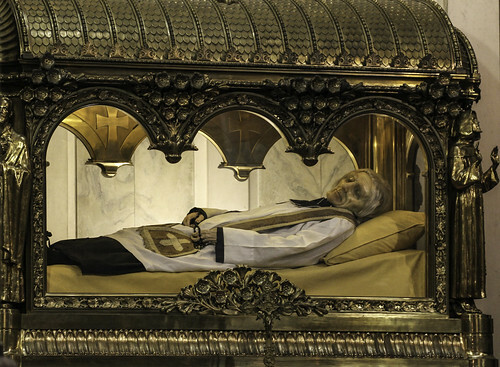 On October 3, 1874, Jean-Baptiste-Marie Vianney was proclaimed Venerable by Pius IX and on January 8, 1905, he was enrolled among the Blessed. Pope Pius X proposed him as a model to the parochial clergy. On May 31, 1925, Pope Pius XI canonized him. His feast is kept on August 4. There has been much discussion, much of it heated, and misunderstanding regarding a quote by St. John Vianney to a married woman regarding childbearing. I have found the context and quote in its entirety from a reliable source. He affirmed that hell exists. The church teaches this. He affirmed that it is possible to go there and that in fact, Hell is not empty. The church teaches this. The church teaches that to die in a state of mortal sin dooms one to Hell. The church teaches that contraception is an intrinsically evil act and in fact could be mortally sinful. Abortion is murder and likewise could be a mortally sinful act. But I also see something else besides the teaching on birth control and abortion. Having a lot of children wears you down, literally. It takes your time, your energy, your body etc and while it does that, at least in my experience it allows the mother to be molded and more pliable in a special way to become holy! Yes, there are opportunities for other sins, like impatience, but in a special way, we can see the simplicity of what God wants for us in the faces and lives of our children as they grow from babies to adulthood. And I think in particularly tough cases... like me!! it takes a lot of children to wear away that stubbornness, willfulness, and selfishness. The physical act of giving birth to the recovery to dealing with a teenager who has willful issues of his own, it all works together to make me a better person! St. John Vianney has a special place in the heart of our family. When my firstborn was getting ready for his first confession, we read The Cure of Ars: The Story of Saint John Vianney, Patron Saint of Parish Priests. It has since become our tradition to read it for each child before they make their confession. It is an engaging book even for adults and it made a big influence on my children. They were particularly impressed with how St. John withstood mocking and insults from the devil and got to the point of actually unimpressed with Satan's antics. Many a dinner time my children would tease one another by jeering, "Potato eater!" at one another as they dug into their mashed or baked potatoes, as that was one of the insults Satan used against St. John because his diet consisted in large part of potatoes. My third son, Gabriel, actually took John Vianney as his confirmation name. When the bishop confirmed him however he only called him "John." That was a little disappointing. There are several St. Johns and each of them have a story and had special gifts; I guess I wanted to hear the differentiation. This St. John is certainly a standout.